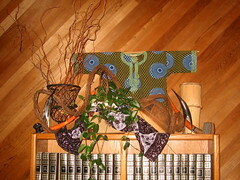 Every winter after Christmas, Esther decorates the living room with an African theme. She hauls out all of the old curios from Nigeria which were handed down to me by my parents. It always stirs up old memories of my childhood. I had always dreamed of returning someday with my family, but as the boys slip steadily off to college, the realization of this dream slowly fades away. I do try to keep up on what's happening in my 'motherland.' The internet is an amazing resource for finding information and images of even an obscure place like Mkar. It has been disturbing to read of the massacre of civilians that occurred at a former mission station a few years ago-the same staion that my family first lived at when arriving in Nigeria. It is hard to understand how tribal differences can create such hostility. Im sorry to hear of the nigerians who have lost their lives! Cute picture of the "Two Couples"
double dating with your son?